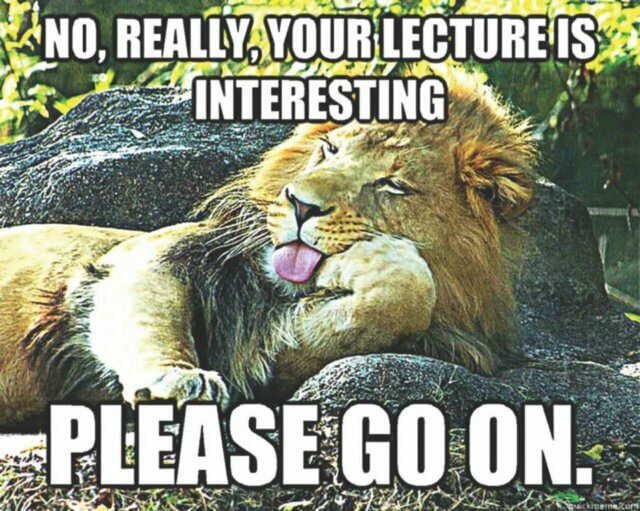 Ah, the ubiquitous conference one-hour lecture. How do I hate thee? Let me count the ways. Actually I don’t need to do that since Donald Bligh listed them all in his classic book What’s The Use Of Lectures?, first published in 1972! Rather than reiterate the shortcomings of broadcast-style teaching, I’ll go positive. Here are three superior alternatives to sitting through an expert’s non-stop utterances. As an example I’ll use a three-day conference I’m currently designing. The participants are four hundred international scientists who only get to meet en masse every few years. It’s important to give them excellent opportunities to discover and connect with cross-disciplinary colleagues and ideas. They also need to share a massive amount of information about their current research in ways that maximize appropriate learning, fruitful connections, and future collaborations. Here are three session formats we’re using for the middle of the conference arc. In my experience, each of them is far more effective than a traditional conference lecture. Most academic conferences schedule large numbers of simultaneous lectures. Instead, we’ve designed sessions with multiple short serial presentations, aka lightning or speed talks. By “short” I mean four minutes per scientist. After a batch of these talks, each presenter moves to a separate space in the room. Participants are then free to meet in small groups with the presenter(s) they chose for in-depth discussions. We’ve scheduled 165 lightning talks grouped into 16 thematic sessions. The four-minute time limitation nudges each presenter to focus on the core aspects of what they want to share and how to communicate them as effectively as possible in the time available. In addition, audience attention remains high because the presenter and their material is changing every five minutes, well within the ten minutes Bligh and John Medina cite as a maximum before listener attention flags. Each session is assigned a facilitator, a timekeeper, and a staffer who projects a pre-assembled master presentation slide deck for the four-minute presentations. One potential drawback of simultaneous sessions is that presenters can’t attend another presentation that’s taking place at the same time. In a thematic poster session, this prevents presenters from engaging with other presenters who are standing next to their own posters. To allow individual presenters the opportunity to engage with some of the other presenters and their content, we’ve divided each poster session into two 45-minute parts. Each poster session begins with half the presenters giving a one-minute summary of their work/poster to everyone present. Attendees then spend the rest of the 45 minutes browsing content that interests them. The poster creator remains available for explanations, elaborations, and discussions as needed. The process is repeated for the second set of presenters. The need to create and deliver an effective one-minute presentation concentrates a presenter’s mind wonderfully! Each session is assigned a facilitator/timekeeper and a staffer who makes the appropriate e-posters available for the presenters. We’ve scheduled 125 poster sessions grouped into 7 thematic sessions. In addition this conference includes a small number of longer sessions on key organizational and science issues. The formats for these sessions vary, but they are all designed to incorporate ten-minute or shorter chunks of presented content or provocative questions interspersed with small group active learning activities. Such sessions provide more effective and appropriate learning than a traditional lecture. They supply learning that is personalized, and that will be remembered longer, in greater detail, and more accurately. Given the sheer volume of information available from the assembled scientific minds at this event and the considerable investment of time and money to hold this conference, it’s important to use session formats like these. They maximize rich knowledge transfer and the likelihood of making the kinds of “aha” connections that can lead to significant advances in the conservation work and research these scientists perform. This is THE most valuable conference I could imagine attending each year.